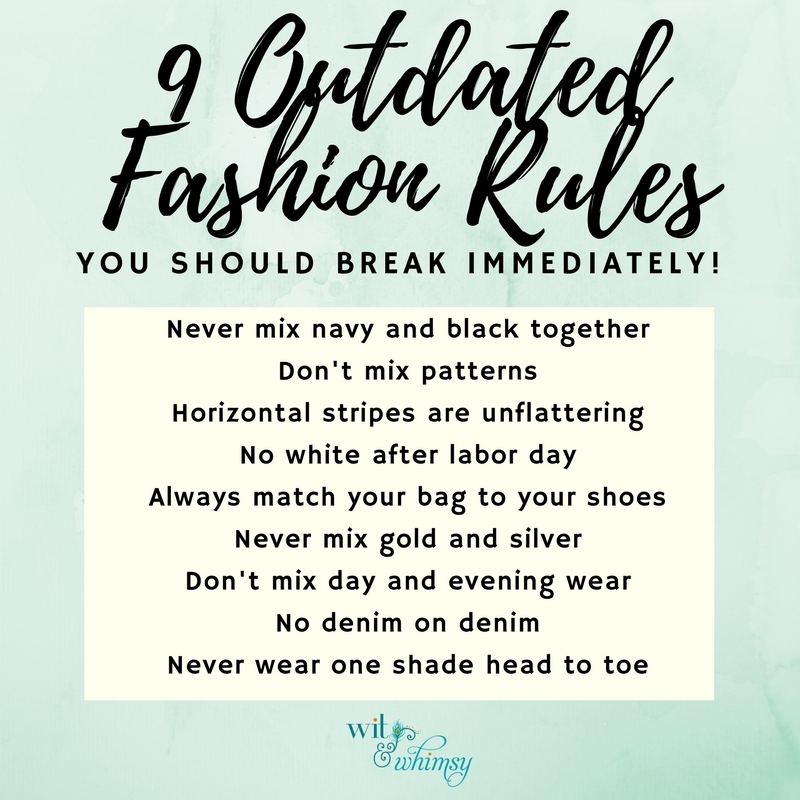 Wit & Whimsy 9 Outdated Fashion Rules You Should Break Immediately! 9 Outdated Fashion Rules You Should Break Immediately! Isn’t it funny how things stick in your head? When I was in second grade a kid in my class, Derek H, told me the last bite of the banana was poisonous. Without question I avoided that last banana bite for the next 14 years. In college I mentioned this to a friend who 1. laughed, 2. proceeded to google it, and 3. gives me a hard time about it to this day. As silly as it seems, we can hear something once and it sticks for life! Sometimes we can have the same issues with clothing. So we’ve compiled some fashion rules that we are giving you complete permission to forget about! Don’t mix navy and black together-You can definitely mix navy and black together--and while we are on the subject of mixing colors, pink and red go together too, and so does brown and black. When it comes to mixing colors look at your outfit as a whole, the goal is an overall look that is aesthetically pleasing. No mixing patterns-One print at a time has been the general rule, but now it’s not only allowed, it’s encouraged! Just a few things to keep in mind- for the easiest pattern mixing keep fabrics in the same color family and choose one to dominate and one as an accent. Horizontal stripes are unflattering- Stripes have gotten a bad reputation for being unattractive, but that doesn’t have to be the case. With thick stripes it’s best to opt for fitted or structured pieces, whereas with slimmer stipes you can pull off looser flowy looks. No white after labor day- You can still pull white out of your closet after Labor Day. Just consider the fabric-wool, silk, and thick knits look chic, but linen and lightweight cotton are more appropriate for summer. Always match your bag to your shoes- No one really cares about this anymore...you have enough to worry about, don’t add this to your list! Never mix gold and silver- Mix your gold and silver together, you can even throw in some copper or rose gold! Don't mix day and evening wear -Sequins are no longer just for nighttime or holidays, pair your shimmery skirt with a casual sweater, take your everyday look up a notch with a fun beaded clutch, or wear that over-the-top sparkly necklace with an otherwise everyday outfit. No denim on denim- Gone are the days when you could only wear a denim jacket or denim jeans. However, to look chic it’s best to chose different washes-like a distressed denim jacket with dark wash skinnies. Or you can always mix it up by pairing colored denim with your favorite blues or jean jacket. Never wear one shade from head to toe- Luckily this is one of those things that's hard to mess up and monochromatic always ends up looking super chic!